This is a totally different kind of project from anything we’ve done before. It’s going to be a lot of fun. We are going to need your participation in order to make it happen. 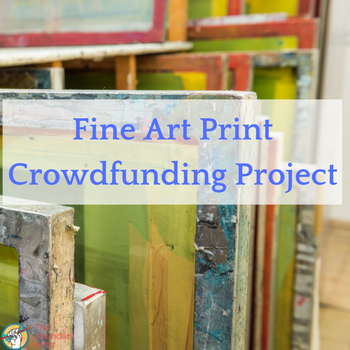 Here’s the basic plan: source a bunch of great artwork from readers like you, curate a digital exhibition, and then run a crowdfunding campaign to turn the work into a limited-edition run of fine art prints. We’ll use the whole experience to build out a best-practice crowdfunding guide for our community — and we’ll raise a bunch of funds for artists in the process. Read on to get involved! The first step for us is to pick the theme of the digital exhibition. To that end, TAA will be working with curator and digital strategist Willa Koerner. She’ll be helping us to choose artworks for the campaign that will be, 1) compelling to potential backers, and 2) artistically interesting and relevant. 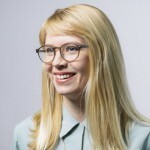 Willa currently directs curation at Kickstarter, and in the past she worked at the San Francisco Museum of Modern Art. She has also worked on digital engagement and creative campaigns for organizations like the Smithsonian and ART21. She was on our podcast back in September (listen here). Once we’ve selected a theme for the print series, we will move on to the next phase of the project. This is a big project, and we want to do it right. It has to fit in around the other projects and business needs that TAA operates under. So we’re sharing everything we have so far, and more details will be forthcoming as time goes along. First of all, it totally aligns with TAA’s goal of helping artists quit their day jobs. It’s a shift away from courses and coaching, but will also help us build out a crowdfunding course for artists. In addition to being an interesting and fun project, it lays the groundwork for helping TAA launch an artist cooperative online gallery. More on that vision in a later blog post. Each of the above phases will be detailed in later blog posts, but for now, we need to pick a curatorial vision for the project. Let us know which of the themes you like by voting on the poll above. This is genius! What a great idea.Yes I want to participate! Agree on theme Fantastical due to its broad inclusivity! This would include many different types of genres and styles of artwork too. My concern as an abstract artist that many viewers will not be drawn to abstract expressionism due to it not being taken seriously enough as an investment. I can relate to this theme more than the others. I can relate to abstract art more than the other categories. You can use any of my work you want. It’s a little unique as media is concerned. How will our artwork be protected against piracy and copyright infringements if we decide to hand over works to be printed? In order to create quality prints they must be high resolution and the number one way of protecting your artwork is to not hand out high resolution images to anyone for reproduction unless you have a proven, trusted print service like Chromazone Ink or someone like that. Can you please detail the technical aspects of how this will work and who will be printing our artwork? Great question Angela. I’ll be on Facebook Live tomorrow morning talking more about this in the morning, 8 AM PST on TAA’s FB page. The short answer is that we’ll be using a reputable printer, similar to Chromazone or an equally represented printer. We haven’t finalized a printing partner yet, and that research will be part of this project. The artists involved will be expected to contribute to the research and assembling a team, with guidance from TAA and our curator, Willa. I would suggest also a complementary publication of all the artworks submitted to be presented as a book celebrating and highlighting such a project – be given to all the contributing artists. Also any volunteers who have helped achieve the goal! This is a great sample for what the artist can achieve. It’s a mobile and tangible bit of resumé that can push further for all involved. It’s an immediate talking point from the coffee table. A look book of collaboration! That simply speaks volumes! Great idea. We’ll likely make that one of the reward levels for the crowdfunding campaign. Yes that thought came to me too to publish a book. Together we can reach so many people also and make this a very successful adventure. Fantastical worlds will be most accepting of many visions from nearly real to sureal. Many artists are working realistically and this would be a fluid catagory. To me it seems a lot of people are bogged down in “fantastical beings’ trope and it all seems like “fitting in” rather than saying anything, no matter how skilled the artwork is. I would also have chosen a ‘look after the planet” subject area if it had been available. I like INSIDE THE MIND best. Art is a creative process of thinking and taps into imagination, expressed passion and creative expression. I think this title leaves more room for all kinds of artistic creations than the other titles. Yes I too agree with you! Well, I was thinking of something more traditional, like a theme of “water” = ocean, lakes, waves, seashore, snow, rivers, creeks, and rain. Of course this theme could be painted in any style that an artist works in. Inside the mind would be very interesting to an audience who doesn’t wonder what goes on inside the mind of artists, as well as provide a broad range of subject, styles and media. Creativity starts in the mind. This would be a great theme. Man, so hard to choose! I think my work would fit better into the first or last choices, but the Super Powered People one really has my interest. I love to hear stories of people who have conquered great odds, been persistent, who haven’t given up for what they believed in, people of conviction and strength. I’ve looked for stories like these as I’ve been working toward my goal of being a full time artist, as it is all about having conviction, being focused, and not giving up no matter what. I like the fantastical theme the best because it has more possibilities can include both realistic and abstract art. This is an interesting project. I am excited to hear more about it. Great idea! Look forward to participating, and seeing what comes of this! Great idea👍🏼 Not sure how well my work fits into any of the three themes though! Have gone with the last one. I actually chose “Super powered people” because I immediately had an idea come to mind. Although I found that the actual theme for me wouldn’t be an issue of favorite, maybe due to my Illustration type experience. I believe we could all find inspiration to fit our styles in which ever theme would be chosen, it would be a brief as I have understood, therefore a starting point to consider, a topic. I believe any style of art can be expressed to the theme. And that is for me a fun part of a brief. The challenge of working out ideas & in a group style like this its exciting to see how each person worked it. Cory will the Fb recording be recorded for viewing later? My Daughter is still up at that time making viewing not possible. Awesome project idea 😀 Thank you for your work! Gosh I’d love to be part of this! I have a Kickstarter plan of my own growing, would definitely like to learn how to use it to best advantage, and will be fascinated to watch how this all works. I think it’s a brilliant idea. Great idea, I like INSIDE THE MIND best. Artmaking is a sort of meditation for many Artist, we struggle with our mind monkeys and put our souls in the artwork during the process of making. Mind and Soul would be also a theme for me. Fantastical or inside the mind sound great. Cory, if we cant make your talk this morning (those dreaded jobs) will you be posting a recording of the discussion ? This is the theme that might be most inclusive for more traditional work or abstract work. Name suggestion Connecting the world through art. As artists we have the opportunity to share our vision to give the public a different view of life. This is an important gift we all have to give to the world. By sharing what our view of life, within and without, we can help others find their own vision. Either Inside the Mind or Super Powered People. Heck I just got back from DC talking about my abstract piece from my 10,000 Hearts for Gina project and how art is important in raising awareness for Rare Disease and then got to explain the deeper meaning of the translation of the work so seems either works. Better yet, have a section for all three. This is awesome! Will totally want to participate if possible. I’m really interested in your project and the positive energy that seems to be created around it !!! Congratulations on your work, I mean all your stimulating videos. Sending you positive thoughts from France !!! Cory, is this a paintings only project? Are other art forms being considered? Thank you. It’s a print run, so anything that can be printed is a good fit.